This Saturday (4/20)! Two Neighborhood Cleanup Events! This Saturday is the annual Kerns/Buckman neighborhood cleanup event. If you’re not familiar with the event, it’s a great way to get rid of bulky waste, yard debris, or recyclables in quantities that are normally too large to leave on the curb on trash day. This year, the event has a new location: the parking lot of Hinson Baptist Church, at SE 20th Avenue & Salmon. For more information on the event, including lists of items that we can and cannot accept, visit the Kerns Neighborhood Association website at http://www.southeastuplift.org/neighborhood/kerns. Also, we were recently contacted by a group called Pick Me Up. They’re organizing monthly cleanup events in Southeast Portland. The first one is also this Saturday, April 20th, from 10am-noon. The event will begin and end at The Madison House, located at 1932 SE Madison Street. For more information, click on the link below to see the event flier, and visit https://www.facebook.com/pdxpickmeup. I wanted to pass along the message regarding a new Portland-based camera project that our company recently unleashed. 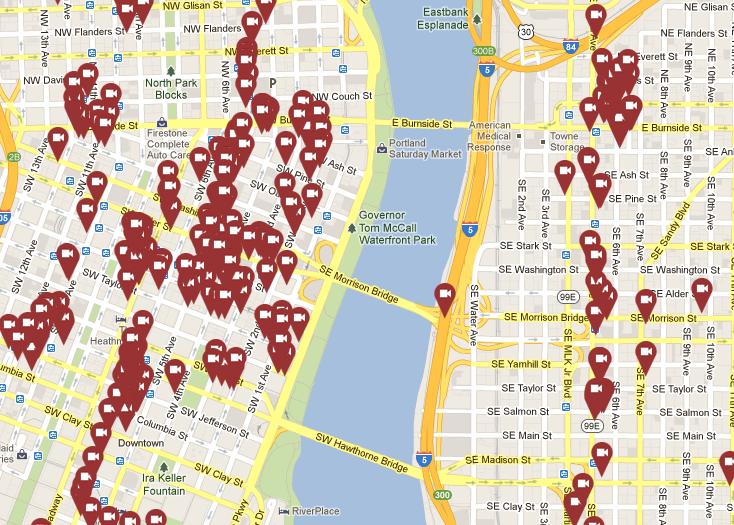 This new community-driven project called CommunityCam provides a map of the locations of public/private security cameras across Portland and its outlying areas. The map is crowd-sourced, meaning any resident, business owner, association, neighborhood group, or government organization, can add locations of surveillance cameras to help their neighbors. People who experience crime can use the map to locate cameras that may have captured the activity and ask their neighbors for help. It’s also good information for the public to have. To date, we’ve mapped about 2,000 cameras in the Pacific NW (all physically seen), and believe it’ll be a great tool for local residents & businesses. We thought this might make for an interesting piece on BCA’s blog or social media pages. Please check out the project website: http://www.videosurveillance.com/communitycam. It’s also optimized for iPhone/iPad devices. Anyone can view the locations of cameras; just use the scroll wheel on your mouse to zoom in on various neighborhoods. To add cameras, use the “+” balloon marker or type in the actual address in the search bar. It’s super easy to use, and free obviously. Clean Out Your Medicine Cabinets! Crime Prevention, the Portland Police Bureau and the DEA will partner on Saturday April 27, 2013 to provide free disposal of your unused and expired prescription medications. One location will be available for you to anonymously drop off your medications at the Portland Police Bureau’s Southeast Precinct, located at 4735 E. Burnside. The drop site will be open from 10:00AM-2:00PM. All medications will be incinerated and will not go into our water supply. For questions, contact Jenni Pullen (formerly Bernheisel) at 503-823-4257 or jenni.bernheisel@portlandoregon.gov. We were recently contact by an organization called Eastside Village. They’re a planning group of eastside residents who are attempting to develop the first grassroots aging-in-place “village” in the Portland metro area. You can learn more by visiting their website at http://eastsidevillage.org. They’re also hosting a series of informational forums. Read on for details. Join us for a free info session to learn more about Portland’s very 1st aging-in-place village. Modeled after Beacon Hill Village in Boston, Eastside Village PDX is not a building or a real estate development or a retirement community. Instead, it is a group of like-minded people who live on Portland’s east side who have come together to develop the resources they will need to age comfortably in their own homes. Village members live in their own homes and can be homeowners, renters, seniors sharing housing or living with relatives. The Eastside Village, PDX boundaries are Powell Blvd on the south; the Willamette River on the west; I-84/Banfield or Halsey (east of I-205) on the north; 122nd on the east (except between Stark and Division where the boundary extends to 130th). There are currently over 90 of these Villages already in existence—including Villages in Bend, Ashland and Seattle—with more than 100 in development across the country. Save Buckman Pool! (Again) Budget Forum Tonight! Once again, the swimming pool at Buckman Elementary School is on the chopping block due to city budget issues. A group of concerned neighbors are mounting a campaign to keep the pool open. Christine Yun, one of the leaders of this effort, has penned an open letter to the community seeking folks who are willing to help save the pool. See below for more details. If you’re interested in participating and/or keeping abreast of the efforts, you can also join the Facebook group Save Buckman Pool at https://www.facebook.com/groups/162961827155597. Buckman Pool is the only Parks facility in the inner eastside. We need to counter the negative article in the Portland Tribune last week, http://portlandtribune.com/pt/9-news/134939-buckman-pool-may-be-drained-by-budget. Please consider writing a letter to the editor at both the Tribune and the Oregonian. In addition, we need to ramp up our e-mails to City Hall. Even if you have already sent an e-mail in, please send another. Look for our rebuttal to the Tribune article this week. It is also available as a pdf on our Facebook page, Save Buckman Pool, if you want to use the facts to help compose your own e-mail. Of prime importance is to attend the budget hearing Thursday, April 11th at Montgomery Park, 6:30-8:30 pm. It’s important to get there early to sign up to testify. Those who arrive late were not allowed to testify. Please also make sure that you print out your signs and bring them to the meeting. Some smart people pasted them on to cardboard to make holding them up easier. These were really effective. Parents, please ask your children to testify – this is a great civic learning experience, and it really has convinced council in the past to keep Buckman Pool open. There is a final city budget hearing Thursday, May 16th, 6:30-8:30 pm at City Hall. We recently received the following information from an organization called Dishcrawl, that leads folks on restaurant tours of neighborhoods. They’re doing one in Buckman soon! Read on for details. Inner South East Portland offers rich culinary destinations set against the backdrop of both its industrial area and the picturesque neighborhood tucked around its corners. Renowned for its culinary institutions as well as bold, new and fresh offerings, Inner South East is the perfect ingredient for delicious sensory experiences. On Wednesday, April 17th, join us as we take you to four Inner South East establishments to enjoy the food adventures of this vibrant neighborhood. Don’t wait! Get tickets now! You can find them at this link: https://dishcrawl.com/purchase/event/1185. It’s a guessing game! We’re keeping the names of the restaurants we will be visiting a secret for now, but here and there we’ll give you some hints. Follow us on Twitter at @DishcrawlPDX and be the first to know! Where to Meet Us: All ticket holders will be notified of the meeting location via email, 48 hours prior to the event. I’m a Vegetarian: Vegetarian options are available; however we may not be able to accommodate other dietary restrictions. If you have any particular requests or have questions, please don’t hesitate to contact us. Questions? Contact me! I’m Sara, your PDX Dishcrawl Ambassador! My email is SaraF@dishcrawl.com. You are currently browsing the Buckman Voice blog archives for April, 2013.